We’ve been making barbecue all day – pulled pork and brisket. And the soundtrack for barbecue is, what else, Kings of Leon. So here’s some live KOL for all of you. Pictures of the cue later. Bug Labs (a Union Square Ventures portfolio company) launched its new website this week and the details of the hardware and software are now out in the open. Engadget has the details if you want a quick summary. Or go visit the product page at Bug Labs to get the full scoop. 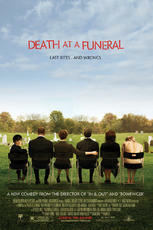 Go see Death at a Funeral. Josh and I went with my mom and dad last night and Josh and I were falling all over each other laughing and kicking. It’s about a funeral where things go haywire. It slapstick, farce, black comedy, and very well done. It’s the funniest movie I’ve seen since Little Miss Sunshine. You have to hand it to the people over at Facebook. They pay attention to what’s going on in their community and when something is out of hand, they fix it. Everyone knows that the race to get the most installs had some bad effects. 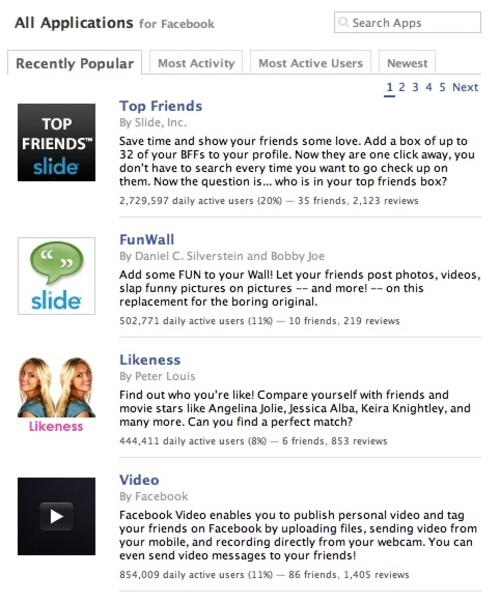 It led to application spamming, cost per install advertising, and the net result was lots of installs and little use. So Facebook made some changes recently to the way they rank applications when you browse the service for new ones. Installs no longer matter. Usage, real usage, matters. Here’s the default tab when you start browsing for apps (the best real estate you can get). Top Friends is still on top, but their 13mm installs don’t matter anymore, its just the 2.7mm people that actually used the Top Friends app recently that counts. As it should be. get into what is actually getting used. In more good news, Appsaholic has adopted the new methodology too. So focusing on installs is over. The game is now daily usage. And that’s exactly what every really cares about at the end of the day. I gotta hand it to Facebook. It seems that they are doing most things right these days, but most importantly, when they see something is wrong, they fix it. And that’s how you build a great company. I put my photos online at Flickr and occasionally directly on this blog. My girls put their photos at Facebook. My niece puts hers on Facebook too. The Gotham Gal occasionally puts photos up at Flickr and on her blog. My parents are visiting and my dad asked if there was a way we could create a shared space on the web where our family could aggregate all of these photos that are being posted in various places and we could comment on them privately. He’d also like to upload his photos to that place since he and my mom don’t upload photos to the web, they just email them around. I think that’s it. Does such a service exist? Josh is obsessed with this song. He puts it on everytime we get in the car and plug in the iPod. What’s funny is that I posted this song last August when I first heard it. I love Dinosaur Jr. and The Lemonheads. In this case, you get two for the price of one. A great summer song with great soloing by J Mascis. Sometimes you write a post asking for something and then months later you find someone has actually built it. That happened with my desire for a Flickr/Twitter integration that I posted about in June. By early August Dave Winer had built it. Also in June (I guess I wanted a lot that month), I posted about the need for tools to engage with advertisments like the way we engage with social media. I called the post "Favoriting Ads". It was a fairly popular post, it got 20 comments, and 7 links. A decent amount of "social media engagement". So I was excited when I saw the idea implemented in the form of a company at Y Combinator’s demo day in early August. The company is called Adpinion and they have built a simple way to vote on ads. You will see one of their ads on this blog, right below the Federated Media banner ad on the right sidebar. Play with it, vote on some ads, save your profile, and let me know what you think. It’s very early days for something like this. For this approach to work, they need a ton of ads. And they basically have none right now. It looks like they are just pulling items from Amazon and turning them into ads you can vote up or down on. But what we all really want is to be able to vote up or down on the Mastercard advertisement or the Financial Times ad, both of which have been in heavy rotation on this blog in recent days. So I am not sure whether Adpinion should try to build an ad network of their own or if they should work with existing ad networks to add value to their inventory and help them target ads. Maybe what Adpinion has done is easy enough for existing ad networks to replicate and that’s what will happen. But regardless of how this all plays out, I am thrilled to see banner ads with up/down buttons on them. It would be a wonderful thing if all banner ads on the Internet had them. Ever since Yankee Hotel Foxtrot was rejected by their label at the time, Reprise, Wilco’s been showing the way forward for bands. Most people know the YHF story. They bought the record back from Reprise for $50k, started streaming it on the net, developed a big buzz about the record, were signed to another label (Nonesuch),and the record sold 500,000 copies, and was recognized as one of the best records of 2002. It’s my favorite Wilco record and we have them all. Since then, Wilco’s put out two excellent studio albums, A Ghost Is Born, and Sky Blue Sky, each exploring new and different sounds, they’ve added the amazing Nels Cline on guitar, and put out one of the best live records in the past 10 years, Kicking Television: Live in Chicago. On top of all that, they’ve become one of the best live rock shows you can see these days. I’ve seen them a bunch in recent years, including a great show this summer at the Warsaw in Brooklyn. David Hyman and some of the team at Mog went to see Wilco this past weekend at the Greek Theater in Berkeley and they came away similarly impressed. The fact is, if you like live rock music, you’ll enjoy an evening with Wilco, regardless if you are a huge fan like me or not. So you have this band, operating at the peak of their talents, making great records, touring like crazy, and what do they do? They license a bunch of songs off their new Sky Blue Sky record to Volkswagon. I knew they had licensed the single, Either Way, because I’ve seen that ad. But the other night, as Josh and I watched the Mets give one away (doing that too much these days) to the Dodgers, we saw the whole bunch of the commercials played over the course of the game. I love these songs and I love that they are in VW commercials. It’s just such a great way to marry two strong brands and showcase Wilco’s new songs to a wider audience than they would otherwise reach. Here’s my favorite, the song is called "The Thanks I Get" and it’s an outtake from the Sky Blue Sky sessions that Wilco’s been playing a lot this summer on tour. You can see all the VW/Wilco commercials on YouTube. There’s been so much talk about artists having no way to make money with music anymore that its accepted as a given. I recognize its harder than ever to make a living making music. And it’s never been easy. But as I’ve always said on this blog, the artists themselves are going to have more options to make money in the future, not less. Wilco’s been figuring that out for the past five years and doing a pretty good job of it. The answer to that questions is of course you can. I still love Howard using that question to announce the sale of Wallstrip. And that also points out that blogging pays its dividends a bit less directly than straight publishing. Sure you can run ads on a blog, as I do, but if you want to make big money, you have to use your blog to do something else. First and foremost you need to build an audience, build trust with them, deliver on a regular basis for them. There’s no way people are going to come back again and again if your blog doesn’t enlighten, entertain, and inform. Jason Calacanis has expertly used his blog to launch two businesses to date, Weblogs and Mahalo. If you click on over to Jason’s blog, you’ll see a picture of our friend Jeff Jarvis, who used his blog to build a very profitable "guru" business. Jeff is also launching several new ventures and I hope and expect he’ll use his blog to help launch them. Which naturally leads me to the venture capital business. I stumbled into blogging as a tool to help me, my partners, and our portfolio companies make money. The model works great. There are a bunch of venture capital blogs out there these days and many are great reads. Everyone knows of my fondness for Brad Feld’s blog. But you might not know that I read Susan Wu and David Beisel regularly. Susan and David are two super sharp up and comers in the VC business whose opinions I have come to respect by reading their blogs. Which leads me to this post by Donna Bogatin taking a shot my occasional shilling for my portfolio companies. I don’t think Donna likes Twitter based on my read of her posts on the subject. That’s not surprising. There are certainly plenty of people who have a strong dislike for Twitter. I take comfort in that in a contrarian sort of way. Shilling for portfolio companies is one of the things I do on this blog. My readers know that. We try to avoid that on the USV blog. We reserve that for think pieces, announcements about new investments, liquidity transactions, and an occasional bit of important news about one of our companies. But I don’t just shill for our portfolio companies. I’ve shilled for YouTube, Flickr, and recently new companies like disqus and search crystal. If I like it, I’ll talk about it. It shouldn’t surprise you that I like the companies we invest in a lot and I’ll talk about them a lot. It’s also true that you have to balance that kind of post with other posts. If it’s something you do occasionally, it’s not a bad thing. If you do it too much, you’ll hear about it from your readers and/or they’ll simply leave. I am sure that many readers have left this blog over the years because they were tired of hearing about delicious or TACODA. That’s the risk of shilling for your portfolio company. But if you have a well read blog, you’ve got an advantage, just like Jason’s, in launching and building a company. My post on Twitter’s new features led to posts at TechCrunch and Donna’s blog among others. We see a lot of entrepreneurs who want to tap into that. It’s a competitive advantage. It’s not going to win us a deal over any other firm all by itself. We have to do a lot of things right to win a deal, including prove to be compatible with the founder and team, pay the right price, and do our homework on the company well. At the margin, the exposure this blog can give a startup company helps quite a bit. And once the investment is won, it continues to help. So in the venture business blogging helps. Sometimes it helps a lot. It did with delicious and I expect it will as well with Twitter. And back to Twitter. I don’t know Donna. But if she was in East Hampton last night, and if she used Twitter, we might have been able to meet after the movie. That would have been neat. She’s got a great blog. In addition to hosting the first board meeting since we invested, Twitter did two really big things this past week that I think are going to make the service a lot more useful to me (and hopefully you). They are both in the area of finding other people you know on Twitter. 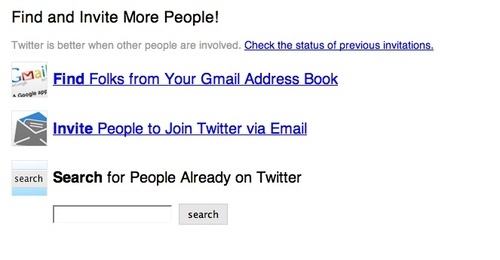 To date, Twitter has made it nearly impossible to find friends on Twitter. That’s a very big shortcoming of an inherently social service. It sort of makes me wonder how Twitter got any users at all. Here’s the new "find and invite" tab in Twitter. The first new service they launched last week was people search. 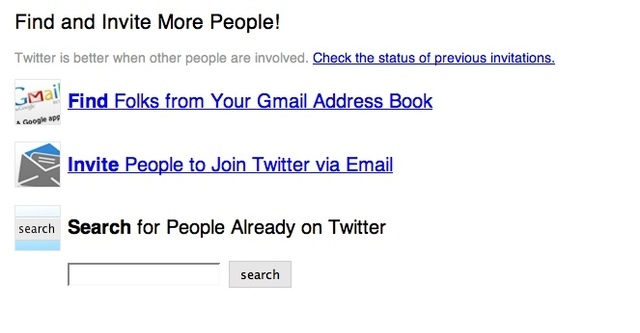 You can now type a name, last or first or both, a location, a URL, pretty much anything someone would put in a twitter profile, in search of people you want to follow. I’ve added about 15-20 people this way in the past couple of days. The second service was launched quietly on friday, so quietly that they don’t even have a post about it on the Twitter blog. 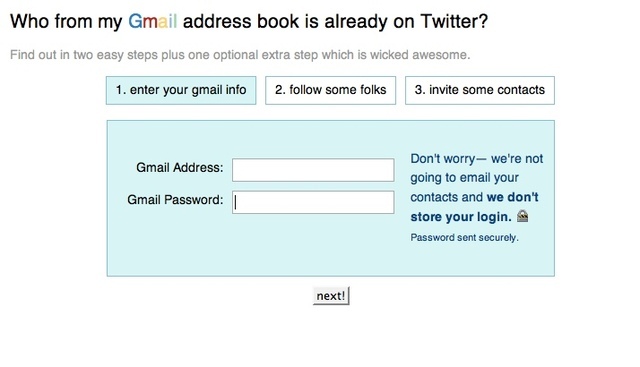 It’s the gmail address book integration. Here’s what that looks like. I just tried it out and it worked great for me. I don’t really use gmail, but from time to time I’ll forward my mail to gmail and use it as a backup. So I have a small address book, certainly less than 500 names in it. Even so, I found three people in Twitter that I had no idea were users and I am now following them. Twitter gets better and better as you follow more people. And now that the default is following on the web and not SMS, the signal to noise issues that plagued the service in the early days are much less. If you tried Twitter early on and found it useless, I suggest you give it a second try. 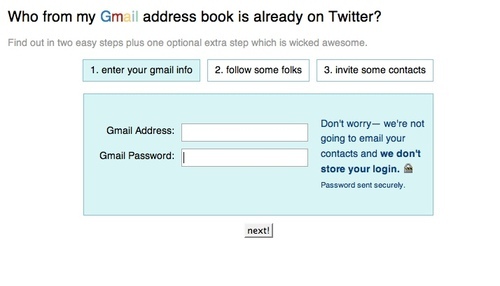 Upload your gmail address book (don’t worry you won’t spam your whole book), and search for a few friends. Get a following list of at least 20-30 people. Then get a desktop client like twitterific or a firefox plug in like twitbin. My bet (literally) is that you’ll find following your friends on twitter to be habit forming. I certainly have. I know that Bijan just went for an exhausting run and Scotty is going out with friends in Vienna. And those are things I like to know.